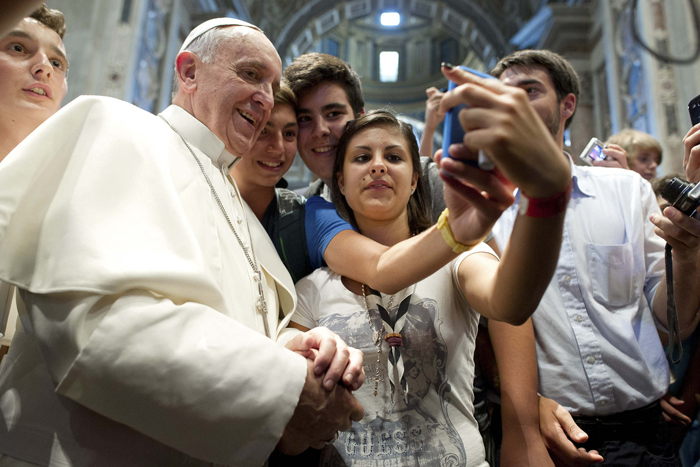 VATICAN CITY (CNS) — Pope Francis told a group of young people to be honest with themselves and others and figure out what they hold dear: money and pride or the desire to do good. He also told them he has made plenty of mistakes in life, being guilty of being too bossy and stubborn. “They say mankind is the only animal that falls in the same well twice,” he said. The pope spoke to six young students and reporters from Belgium, who were accompanied by Bishop Lucas Van Looy of Ghent. They video-recorded the interview in the papal study of the Vatican’s Apostolic Palace March 31 and aired an edited version on Belgian TV April 3. The young Belgians, including the cameraman, asked their questions in English, and the pope answered in Italian. The Vatican released a written transcript of the full interview April 5. One woman told the pope she does not believe in God, and asked what message he would give to the whole world. “Find a way to speak with authenticity,” the pope said, which involves speaking to others as our brothers and sisters. The 25-year-old reporter operating the camera asked the pope whether he was happy and why, given that everyone in the world is trying to find joy. The interpreter clarified that the woman was specifically looking for a way to face her fear of evangelizing, especially in such a secular culture. “If you go with your faith with a banner, like the Crusades, and you go and proselytize, that’s not good,” the pope said. Instead, “Give witness with simplicity” and humility, show people who you are “without triumphalism.” “This isn’t scary. Don’t go on the Crusades,” he added. But with time, he said, he learned that it’s important to truly listen to what other people think and to dialogue with them. It took a while to find a happy medium between being too hard and too lax, “but I still make mistakes, you know?” he said. He said he knows his preference for the poor led someone to claim, “‘This pope is a communist.’ No. This is the banner of the Gospel, not of communism;” all people have to do is read the Gospels and see how Christ put the poor at the center of his ministry, he said. One woman told the pope she does not believe in God, but “your acts and ideas inspire me.” She asked what kind of message he would give to the whole world — believers and nonbelievers alike. The important thing, Pope Francis said, is to “find a way to speak with authenticity,” which involves seeing and speaking to others as our brothers and sisters. Responding to the cameraman’s doubts about whether the human race is truly capable of caring for the world and each other, the pope said, he, too, asks: Where is mankind and where is God in the world today? “It’s a long road. Some people don’t find him during their lifetime” or they’re not aware that they have found him. An authentic, honest and mature person is capable of having “an encounter with God, which is always a grace” and a gift. They asked the pope to pose a question for them. The pope asked them: What do you treasure and hold close to your hearts?